An award-winning affordable contemporary home for Cape Cod, MA. Design by ERA / Eric Rothfeder Architect. The NaCl3 House answers Cape Cod’s issues of affordability and sustainability by threading local design vernacular into contemporary form and practice. The house recalls the peaked roof and proportions of classic Cape Cod and Saltbox homes, yet its form is abstract, monolithic and sculptural. Alluding to the Cape’s ubiquitous aged shingles, the House’s wood siding wraps the facade and roof, and then extends into the landscape to define a private deck. Over time, weathering will contrast the home’s simple outline against the complex grain of its facade. In contrast to the traditional Cape Cod house, which is entered on the long facade and organized centrally, the NaCl3 House is configured in a linear sequence. 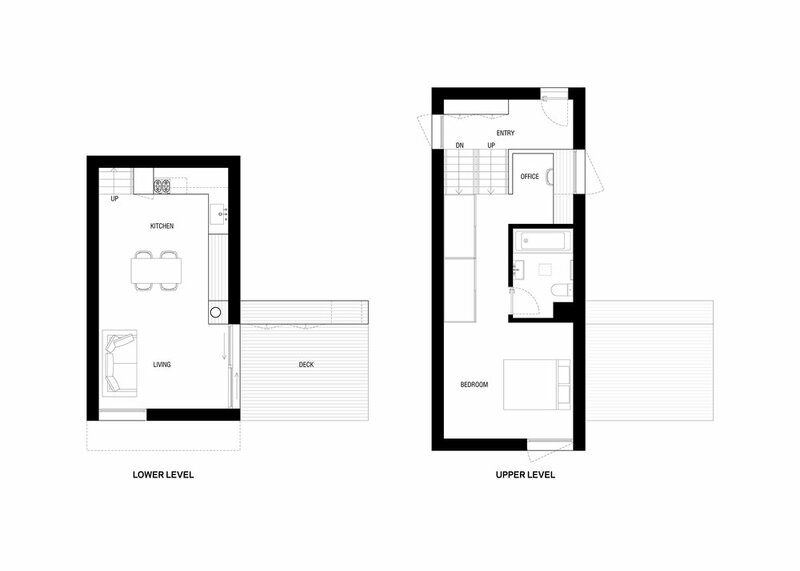 The upper level contains an entry, small office, bathroom, storage, and a bedroom with southern views towards the coastline. Living and dining spaces are located on the lower floor, where the exterior facade turns inside to form walls, benches and cabinets. The NaCl3 House uses the site’s slope to the benefit of both homes. The house’s telescoping design reduces the footprint on the landscape and preserves the views and rear yard of the existing home. Inside the house, the split levels separate public and private functions, and give both the living room and bedroom south-facing views. William Morgan. “Add-On 13: Contemporary Affordable Housing for Cape Cod,” in 2014 Competitions Annual, pp. 232-237. Louisville: The Competition Project, 2015.